Looking for an egg-rich meal to start your day? And it shouldn’t make much of a mess either, because you need to quickly nourish your body and get on your busy way? Forget about lining your muffin tin with paper – that’s so old school, plus it is a waste that quickly gets thrown away. Have you tried lining it with ham instead? It will save you precious morning moments and it is a great meal prep hack. Prosciutto will do nicely, if that is what you happen to have on hand, but thicker sliced ham holds the most ingredients, so find one that you love and stick to it (it won’t stick to your pan!). Choosing cured meats can be tricky and you will have to read the ingredients to be sure there is nothing in there, think added sugar, which you will want to avoid to reach a state of ketosis. You may also find that uncured or fresh ham works really well, and it does not contain nitrites, so you can feel good about eating ham cup after ham cup. If you are an adventurous cook, or a do-it-yourselfer of the explorative kind, then perhaps it is time to learn how to make your own homemade ham – it takes a week to make, but is totally worth the minimal effort and you can slice it any which way you like it. Press a slice of ham into each cup of the muffin tin, arranging the edges to form a cup. Melt coconut oil in a skillet over medium heat, add the bell pepper and cook 2 to 3 minutes. Add the tomatoes and cook another 2 to 3 minutes, stirring well. Lower the heat to low and add the spinach and toss until wilted, 1 to 2 minutes. Fill each ham slice with the vegetable mixture, equally divided. In a bowl whisk the eggs, coconut milk, and season to taste. 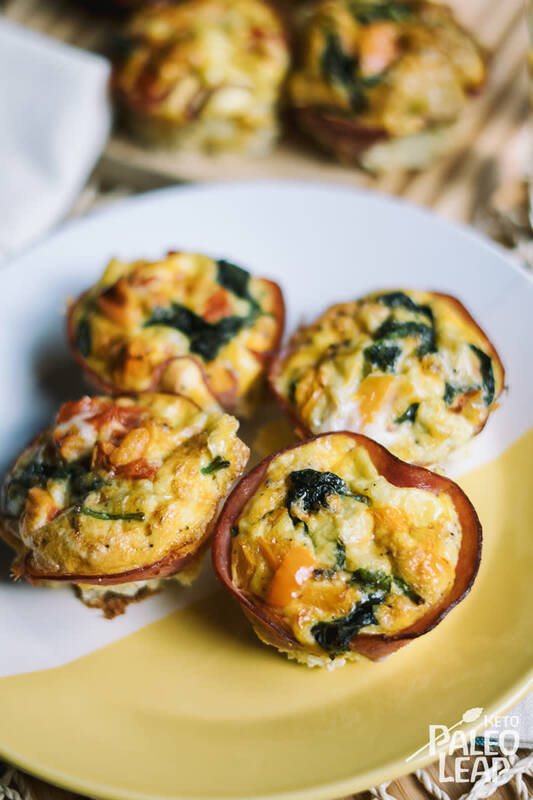 Fill each muffin tin with the egg mixture and place in the oven. Bake 20 to 25 minutes, or until eggs are set.